Ahh I love a good side hustle. I've been side hustlin' ever since middle school where I made notebooks from paper and staples to sell to my classmates. When I first started on my own in the workforce, I soon realized that one stream of income just wasn't enough. Then becoming a mom and realizing just how expensive kids are, my want for multiple streams of income grew. I once read online somewhere that most millionaires have SEVEN streams of income! I'm not anticipating becoming a millionaire any time soon, but being able to live comfortably and not worry about money would be nice. Before I get into the list, I want to tell you a bit about my current side hustle situation. My husband and I both have full time jobs, so anything outside of our 9-5 is what I consider a side hustle. Someday I hope to make my side hustles a full time gig. A couple of years ago, my husband and I started a small moving "business" after buying our truck. I put business in quotations because it was just us, our truck and a few advertisements offering to move furniture and other household items for money. It was hard work, but we made enough to fuel our vehicles and get some groceries each week. In 2017 I decided to follow my passion and turn my blog into a business. It's a constant work in progress and I'm not at the point where I can quit my day job yet but that is my ultimate goal. I also started freelance writing for a website and an awesome new magazine (which I will talk more about in another post very soon!). My goal for 2018 is to up my freelancing game and continue to guide my blog into it's own business. I also opened an Etsy shop called Harbour and Pine just last month which I have a lot of plans for this year. My husband is jumping on the side hustle bandwagon this year as well. While continuing to work at his day job, he will also be starting a weekend endeavor very soon that I will talk about in another post. SO, YOU WANNA START A SIDE HUSTLE? I think the best side hustle consists of something you're passionate about. Passion is key because it's what keeps you going when you come home from your day job and just want to watch Netflix in bed. If you're trying to start a side hustle for something that you hate, you won't be motivated enough to put in the work needed to keep it going. Education is also necessary for some side hustles depending on what you're wanting to do. For example, I wouldn't recommend starting a weekend yoga class if you're not a trained yoga instructor. 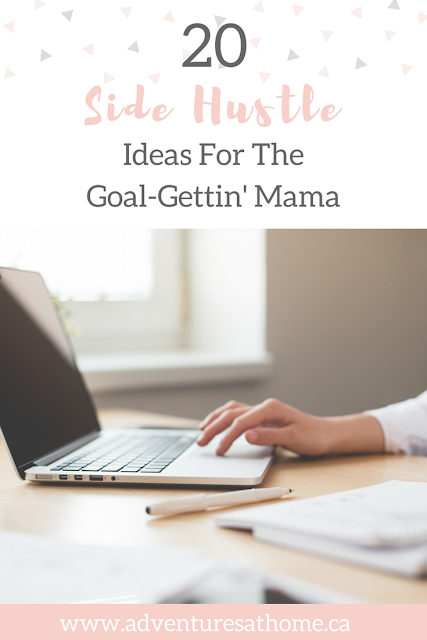 If you're a stay at home mom, you may be looking for something to bring in a little extra income, so these ideas are for you too! Do you have a topic that you want to share with the world? Write an e-book, promote it like crazy and wait for the $$ to flow in. If you're good at cleaning (or actually enjoy it), cleaning houses on the side might be a good fit for you! Make sure to have a recent criminal record check ready to show possible clients, and advertise your services on Kijiji, Facebook or Craigslist. If you have the call to be creative, an Etsy shop is the perfect place to let your creativity shine. Most markets are only open on the weekend, which makes it a perfect weekend side hustle. Sell handmade items, food, refurbished furniture, etc. Do you have a clean and childproof house with space for a few kids to learn and play? A lot of mamas might be looking for casual weekend childcare. Who doesn't love spending time with sweet fur babies? I follow this awesome dog walker on Facebook through her page called "At Work? We Walk!" and I've been itching to be a dog walker ever since finding her lol. She takes the dogs on awesome adventures through woods, ponds, fields, etc, and they have the time of their lives. Do you have an awesome guest room, a beach house, or a country cottage? Consider renting it out to people on Airbnb! You knew I had to include this one. This is NOT a get rich quick kind of business. Do not start a blog with the only goal of making tons of money. Blogs need to be written with passion and come from a love of writing and wanting to share information. Bloggers make money through multiple streams of income including ads, affiliate sales, sponsored posts, collaborations, e-books, selling courses, etc. Are you Pinterest obsessed with a love of decorating, planning and creating? Consider planning children's birthday parties! I wouldn't suggest being a planner or decorator for huge events if you aren't professionally trained, but for small birthday parties I think it's fine. Most parents would love to hire help for setting up and taking down especially, because after dealing with sugar hyped kids all day the last thing anyone wants to do is clean. Do you make your significant other stop the car when you see a free dresser on the side of the road? Do you love painting, and restoring furniture? Finding cheap or free pieces, restoring them and selling them for a profit might be a good fit for you! If you've got a knack for writing you may be interested in freelancing. Websites are often looking for guest writers, bloggers and contributors and will either pay per article or per word. This is what we do occasionally, and it always brings in a nice little profit. Most people will pay $50+ for help moving large furniture, moving their belongings to another house, picking up appliance's from the store, etc. If you have a background in HR, this may be a good fit for you! I do not have a background in HR, but I consider myself an ace at resume writing, and I constantly have friends and family getting me to make their resumes. Many people need and will pay for this service. Virtual assistants provide online support and assist with daily tasks like running a website, managing social media accounts, etc. Do you love keeping things organized and tidy? Helping other people organize their homes might be the perfect side hustle for you! Do you consider yourself an expert in a particular field? Many bloggers create online courses and challenges as an extra income stream, but you don't have to be a blogger to do this. I've seen many people set up a website and offer courses either in person or through email. Some examples could be: a weight loss or fitness challenge, how to start a blog, a guide to decluttering, etc. You can pretty much create a challenge or course for anything you're interested in if you think it's something that can help people. Personally, one of the main reason's we haven't gotten a pet yet is because we wouldn't have anyone to watch it when we travel. If you know how to properly take care of a pet and have the space to do so, pet sitting is a great side hustle. To me an ideal pet sitter would have a safe and clean house, a fenced in back yard (if they were going to watch dogs), a clean criminal record check, and would constantly send me photos of my pet having fun (I'm serious). Many parents hire tutors for their children and if you are educated and good with kids and teens this may be a great side hustle for you! There are tons of life coach courses online that could give you the necessary training to become a part time life coach. I am currently obsessed with the law of attraction and manifestation- and I have seen A LOT of law of attraction/positive thinking coaches that do coaching sessions through Skype, FaceTime, etc. Comment below and tell me if you have a side hustle! What is it? What side hustle ideas do you have that aren't listed?